First Reformed is a film about depression and despair. While the two may go hand in hand, they are not the same. Depression is the unshakeable feeling that life is pointless. 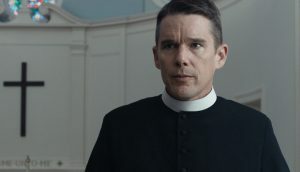 Schrader’s character Mary (Amanda Seyfried) describes it well—“This dark curtain just fell.” When we first meet First Reformed’s central character, the Reverend Ernst Toller (Ethan Hawke), he’s very depressed for many good reasons. He’s lost a son in the Iraq war, his wife has divorced him, and he’s pastor of a dying church with a distinguished history. The first shot in First Reformed is a long, forbidding picture of the First Reformed Church of Snowbridge, New York. We learn that it will soon celebrate the 250th anniversary of its founding and that the building is to be reconsecrated with the mayor and the governor in attendance. It boasts bullet holes from the Revolutionary War and a cellar that hid runaway slaves on the Underground Railroad, but now its Sunday morning worshippers number less than a dozen. First Reformed has become a tourist attraction, dependent upon the Abundant Life megachurch down the road for its financial survival. It is as Abundant Life’s Reverend Jeffers (Cedric Kyles, aka Cedric the Entertainer) describes it—“the museum”—and Toller is more its caretaker than its pastor. 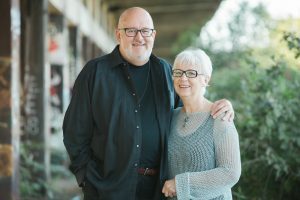 Reverend Toller is also dying of cancer, which he “treats” with a mixture of denial, Scotch-and-Pepto Bismol cocktails, and self-imposed asceticism. His manse looks like a monk’s cell: a single bed, a desk and chair, and a bathroom lit by a bare light bulb. His is a life without life, without color, without hope, but his depression doesn’t give way to despair until after he meets Michael (Philip Ettinger) and his wife Mary. If depression is the feeling that life is without purpose, despair is the conviction that this is so. Michael isn’t only depressed, he’s in despair because he is convinced that we face a looming environmental disaster in 2050: 2’ higher seas on the east coast, low lying areas around the globe under water, central Africa with a 50% reduction in crops due to drought, our western reservoirs dried up, climate change refugees, epidemics, opportunistic diseases, anarchy, martial law and more. (Michael may be speaking for Schrader here. In an interview with Variety Schrader said he didn’t expect human begins “to survive this century.”) What causes these fears to take root in his heart and produce despair? Mary is pregnant, and when he asks, “How do you bring a little girl… you know, a child that’s so full of hope and naïve beliefs into a world where that little girl, she grows up to be a young woman and she looks you in the eyes, and she says that you knew this all along, didn’t you?” Toller has no answer. Toller’s faith seems much weaker than Michael’s despair, so much so that he makes no attempt to inspire Michael biblically, offering instead a little warmed-over Kierkegaard. “Courage,” he says,” is the solution to despair; reason provides no answers.” It isn’t surprising that his words fall on deaf ears. Michael’s fears, however, give substance to Toller’s depression, they justify his feelings, and that convinces him powerfully. To be sure he does his best to restrain Michael’s growing thirst for violence, and when Mary finds a suicide bomber’s vest Michael made, Toller is horrified and takes it away. But neither his words nor his actions prevent Michael’s death, and his death has profound consequences. It brings Toller and Mary together. One evening in a panic she shows up at Toller’s rooms and tells how Michael used to calm her. They’d do what she called the Magical Mystery Tour: lying on top of one another fully clothed, looking directly into each other’s eyes, they’d breathe and move in rhythm. When Toller suggests he and Mary try it, they do. What follows is rather fantastical. After a moment they float up into the air together, the room disappears, replaced by an image of the night sky, followed by a series of other images. First the scenes are lovely–a snow-covered mountaintop, the ocean, forests—then increasingly disturbing—pictures of traffic, hills of worn out auto tires, smokestacks belching smoke, a desolate logged-over countryside, heaps of burning garbage, then fade to black. Michael’s death also pushes Toller from depression into despair. The reconsecration of First Reformed is funded by Abundant Life, which is funded by a wealthy industrialist with a reputation for doing environmental damage. As the day approaches Toller sees in it an alternative to the sham ministry that has been his life’s work for so long. He sees it as an opportunity to vindicate Michael’s concerns, perhaps to avenge his death, and to at least symbolically strike a blow against the forces that he is convinced are destroying God’s creation. So when the day arrives he prepares himself: washing, shaving, carefully combing his hair before donning Michael’s bomber vest. His intentions are clear, but they’re thwarted by the unexpected arrival at the church of Mary, whom he has warned to stay away. His choice of what to do next is the turning point and the finale of the story. I recommend First Reformed’s artistry to you without reservation. It’s stunning in its austere beauty. I’ve not seen a film since The Lives of Others that uses color, or the lack of it, so powerfully. Brian Williams’ soundtrack seamlessly mixes music and silence, underscoring the message of the film without calling too much attention to itself. For example, his juxtaposition of an old hymn—“Are you Washed in the Blood of the Lamb?” (Are you walking daily by the Savior’s side? Are you washed in the blood of the Lamb? )—with Neil Young’s “Who’s Gonna Stand Up?” (Who’s gonna stand up and save the earth? Who’s gonna say that she’s had enough?) is brilliantly ironic. Schrader isn’t so much a prophet predicting disaster in First Reformed as he is an artist bringing his fears to life, and he does it so very well. Watch First Reformed with friends who enjoy a serious conversation. You’ll not be disappointed. But do not dare to take it lightly. There’s a weight to First Reformed’s glory that must be reckoned with. 1. What’s your first impression of First Reformed? What feelings does it evoke in you? What questions does it leave you thinking about? 2. Are you drawn to any one character in First Reformed? If so, who, and, as best as you know, why? 3. Have you ever struggled with depression or despair? What if anything helped you deal with it? 4. Put yourself in Rev. Toller’s shoes for a moment. Which of his very heavy burdens do you feel most closely? If you were asked by him for advice on how to bear them, what might you say? 5. Again, please put yourself in Toller’s shoes for a moment. How would you answer the hypothetical question Michael fears his daughter might ask him? 6. Michael’s despair is quantifiable. He thinks the environment is going to collapse catastrophically soon. Do you share his conviction? If not, why not? If so, what are you doing about it? 7. Director Paul Schrader thinks the human race will not survive this century. Do you agree? If not, why not? 8. If you were privileged to watch First Reformed with writer and director Paul Schrader, what questions would you ask of him? 9. Discuss the ending of First Reformed. Were you surprised by it? Pleased? What do you think happens in the 24 hours after the film ends? 10. How would you define hope? How does it differ with optimism?